Utility bills can be confusing. But we’re keeping our part simple. At Sonoma Clean Power, sustainable solutions mean real benefits. We source, or generate, cleaner electricity for our customers. Our default electricity service is 45% renewable* and 87% carbon-free! 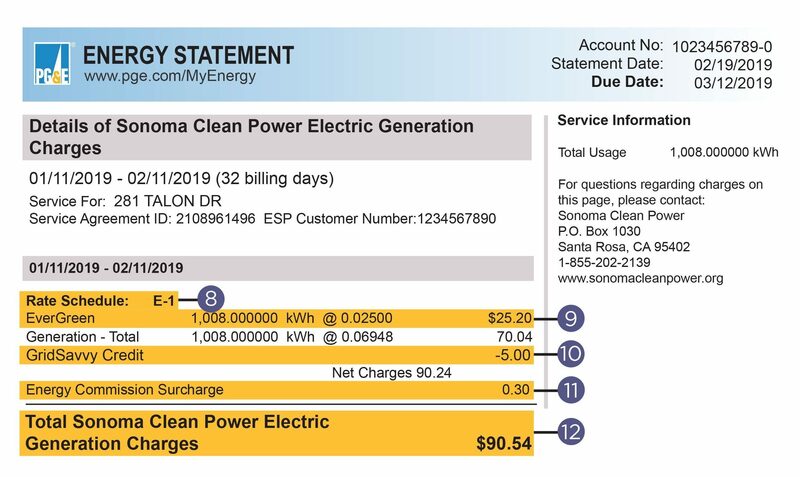 Once you establish service for your home or business through PG&E, your service will start automatically with SCP and your Sonoma Clean Power charges will be presented on your PG&E bill. These are not duplicative charges, but charges for two different services: PG&E electric delivery service and SCP electric generation service. If you want to know more about your bill, we invite you to review the video and sample bill below that explains the various charges. This PG&E account number is needed to sign up for EverGreen service or to opt out and return to PG&E. Just use the 10 digits before the dash. 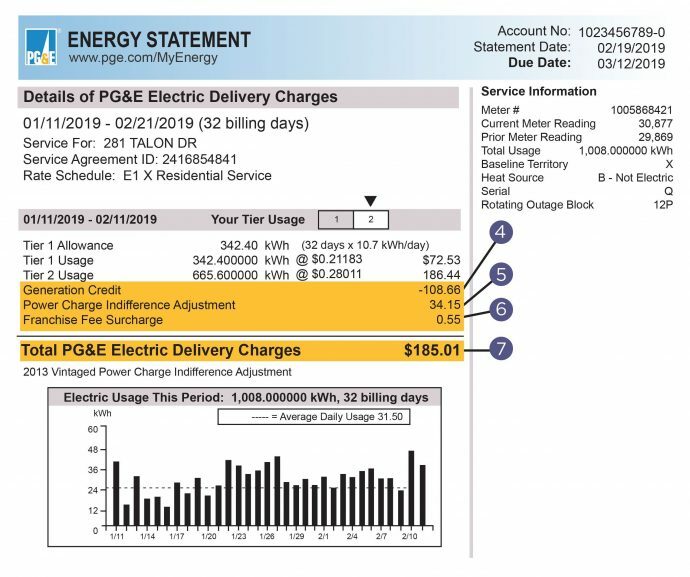 This is PG&E’s charge for the delivery of electricity. It includes transmission, distribution, and a variety of other fees. It does NOT include generation charges if you’re an SCP customer. The Total Amount Due includes ALL of your fees for PG&E gas service, electric delivery and SCP electricity generation services. You should pay the total amount due on your bill to PG&E. By partnering with PG&E to have just one bill, we keep it simpler for you. This is the sum of the Transmission, Distribution, Public Purpose Programs, taxes, and other fees required by law, including: Nuclear Decommissioning, Conservation Incentive Adjustment fees or credits, DWR Bond Charge, Competition Transition Charges (CTC), Energy Cost Recovery Amount, Taxes and Other. A service agreement documents your particular arrangement with PG&E (including billing days, metering information, and other factors) in order to calculate applicable charges. This number is the amount that PG&E would have charged you for Electric Generation. This number is helpful in comparing SCP’s electric generation cost to PG&E’s electric generation cost. 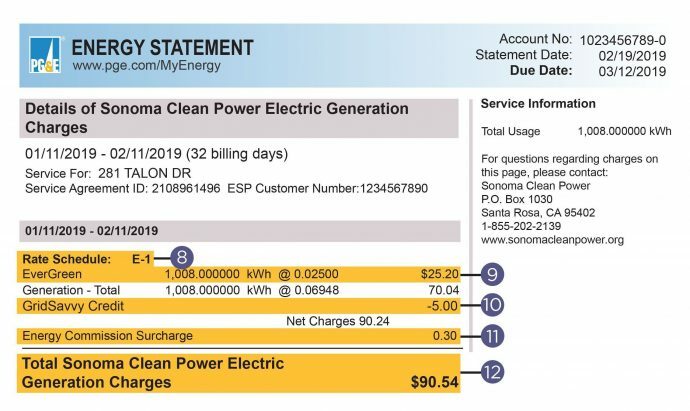 This fee is required by PG&E of all Sonoma Clean Power customers. 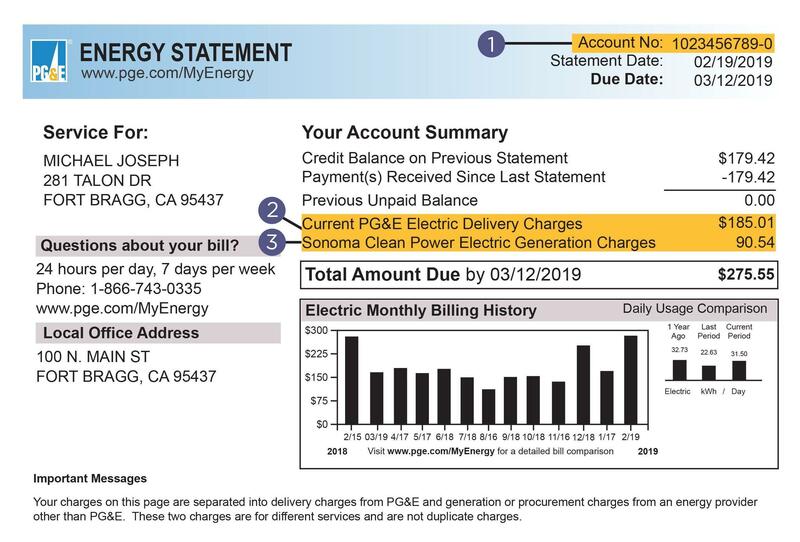 It is intended to ensure that customers who switch to SCP pay for the above-market cost of energy that PG&E bought on their behalf prior to the change in service. This fee is collected by PG&E to pay for the right to use public streets to run gas and electric service. This is the sum of PG&E’s charges for electric delivery, which matches the charge on the summary page of your bill.